Trouble brews for our computer programmers, as they try to figure out a way to return to the real world while staying alive despite the deadly traps they themselves created! Meanwhile, the personalities of the characters run amok in the bodies of their originators, adapting to the real world in ways that can only lead to chaos in the streets. 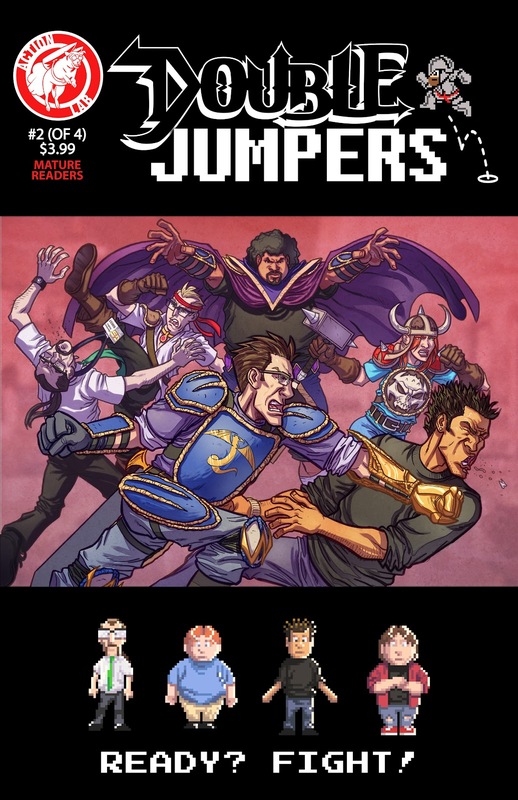 If something doesn't give soon, it's going to be game over for the cast of Double Jumpers! The story itself this time, after working backwards from reaction shots again, follows each set of protagonists, shifting roughly equally between them. While the programmers are trying to figure out how to escape while not fighting among each other, the programmed really steal the spotlight on this one. They do everything from steal candy from a baby to learning you can't beat the house to beating up a set of rivals whose mouths get ahead of them, all with snappy dialogue and comic misunderstandings. It's going to be fun to see what adventures they get into next, given that there's still two more issues to fill and this one was pretty packed in terms of action. I'd be remiss if I didn't mention that under the humor there is a sinister element. The programmers do not like each other, leading to a lot of the crass cursing. As a result, their program is flawed, and just how flawed might now determine if they live or die. It's a nice touch by Dwonch that could get easily lost within the patter and punches that helps ground the series and is a big part of why this issue improves on the first. Bill Blankenship continues to excel on the art duties, placing the characters in such a way that enhances the script. He's equally able to draw both the gaming world and the real world and his designs for the ways in which the computer characters change their human hosts' looks is perfect. There's great variety in his use of body shapes and ideas, and the reaction shots of those who see the warriors really kills me. You can lose a lot of the joke with stolid characters in a parody comic, but Blankenship works in harmony with his writer and it shows. 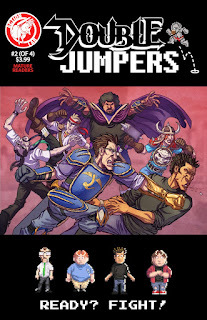 If you were planning on passing after one issue of Double Jumpers, give it another shot. The premise is as good as ever and now the writing is settling into the job. The comic returns to the shops and cyber-locations this month, starting in some places tomorrow, so keep an eye out (and a few dollars saved) for this one. Fans of low comedy and smashing things are sure to enjoy it!